Carrying off an architectural style is all about the details. 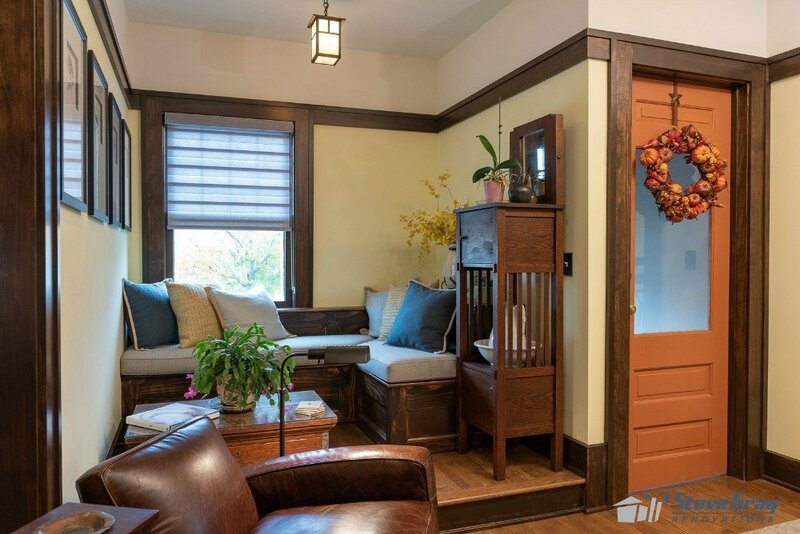 The owner of this home was looking to update his space while keeping its original charm. The structure was built in 1910 and is located in an historical district in Downtown Greenfield, Indiana. 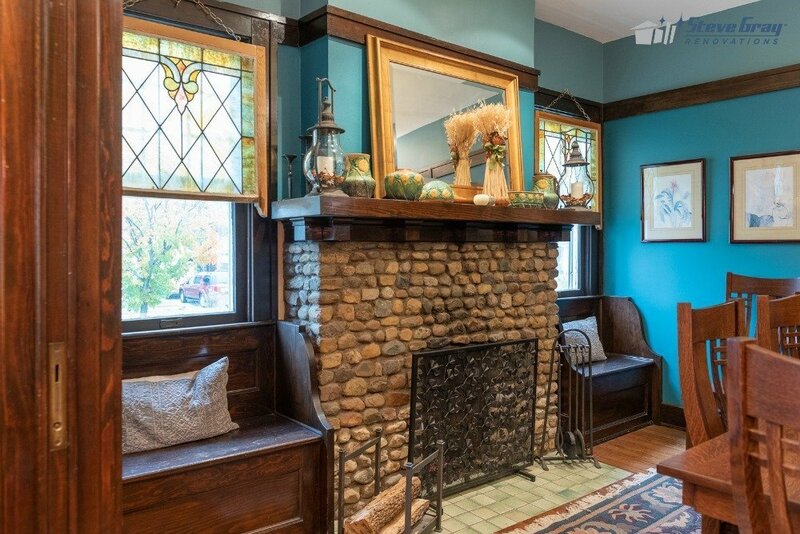 Our client had always wanted an Arts and Crafts styled home, so when he purchased this one he knew with updates it would be perfect for him. With a passion for cooking (and cooks books) and a large family that he entertains often in mind, we began the process of creating the new design. We measured our client’s cookbooks to ensure the new shelving would fit each type. During our initial meeting, we discussed what the ideal space would be able to accomplish. Along with an updated kitchen, a defined space to store and highlight his large cookbook collection, was important. To achieve this goal, we created a design that changed the original footprint, adding 375 square feet of new space to the back of the home for a new kitchen. This layout also gave us the opportunity to move the laundry room to a more functional location in the home. The existing kitchen would become a sitting area and cookbook library. The home was filled with wonderful Arts and Crafts details that needed to continue into anything we added to the home. Our goal was to match the woodwork exactly in the custom casing, baseboards, and interior doors. It is no small task to match wood from 1910. Back then slow-growth trees were used in home building, which have unique grain patterns that today’s fast-growing trees do not mimic. Our interior trim carpenters and other partners were able to come up with the solution to duplicate the look. Another factor was finding a wood species that would take up the stain in the same way. Once we found the right wood species, we created a custom stain to exactly match the existing woodwork. The same process had to be completed to create the new cookbook library case and the interior doors. 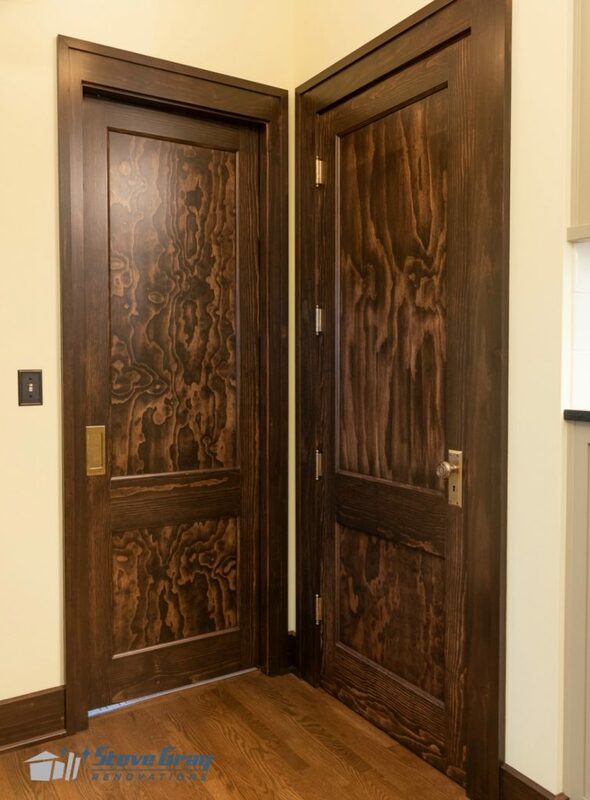 The grain and stain of any new doors (left is a pocket door, a closet door is on the right) had to match those in the rest of the house. This kind of custom millwork was central to carrying off the intention of the renovation. Everything we did had to look original to the house. One aspect the homeowner wanted to recreate was the pews on either side of the fireplace. He had an old picture of the home that showed arms on both sides of the pieces, one of which was missing now for both. We had the new arms custom built and stained to look original. Speaking of the fireplace, it needed a lot of restoration as well. We made it function again, as well as reset a bunch of loose stones. The homeowner also wanted the hearth retiled, but again it needed to look original to the space. 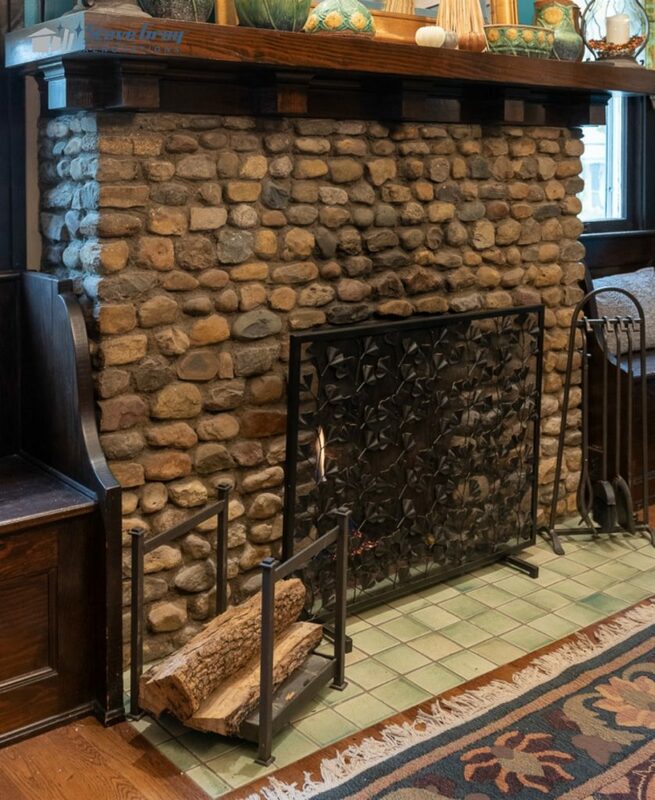 Fortunately, my trusted tile partner, Jesse Tremain of Tremain Tile, Marble and Granite, had vintage tile stored in his warehouse that was perfect. On every project we do, what seems like luck is usually just the talent and foresight of our partners. 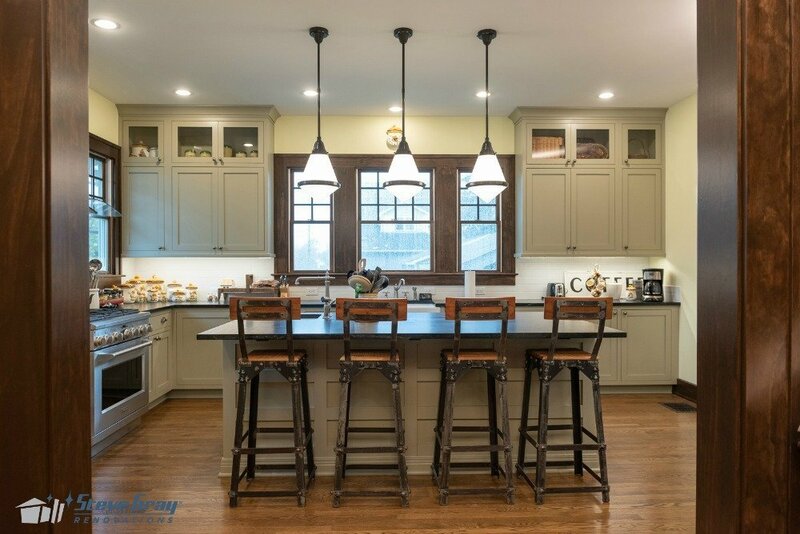 My client has a big family for which he loves to cook a lot of food, so the kitchen remodel had to support that need while fitting into the look of the home. Since we were adding on completely new space, the design started from scratch. A professional cook’s kitchen was created for him, with multiple prep and serving spaces, professional grade appliances, and plenty of storage. 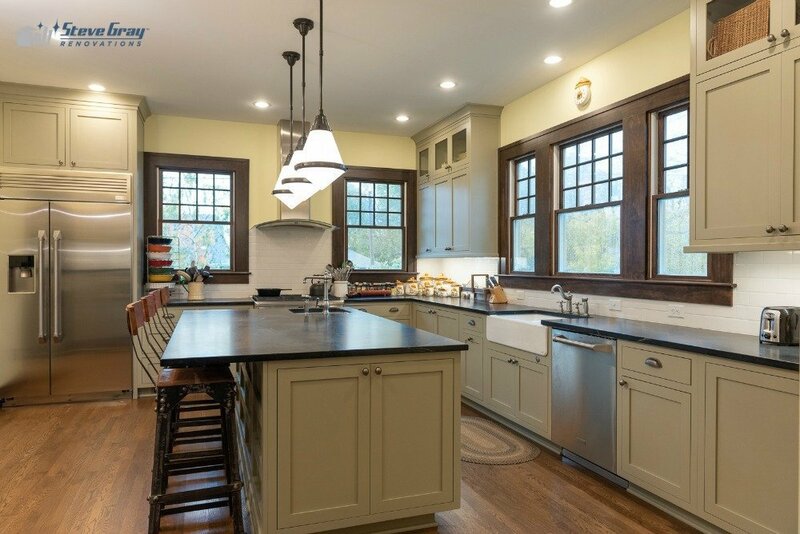 The cabinetry was chosen for its nod to the Arts and Crafts style with simple lines and plain doors. Our client was looking to have visual interest on the backside of the island, so we added millwork to match the look of the rest of the trim in the home. 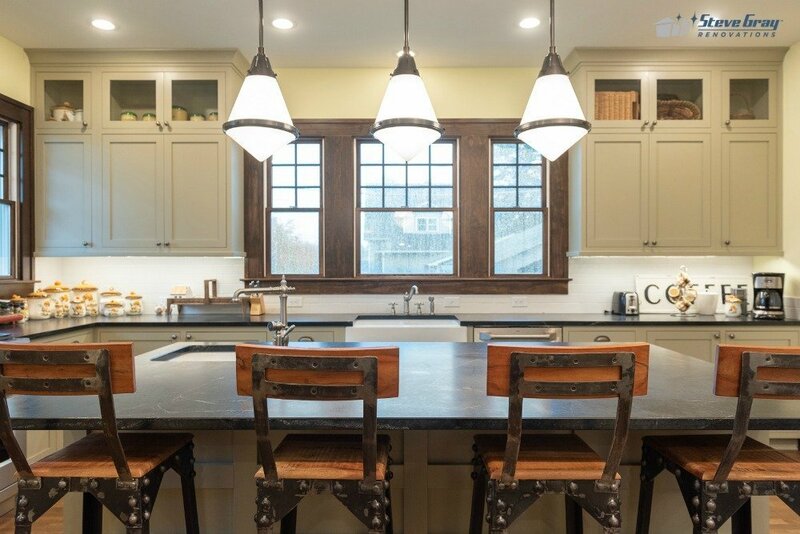 Soapstone was used for the countertops, a material our client prefers for its durability, cleanliness and eventual patina. 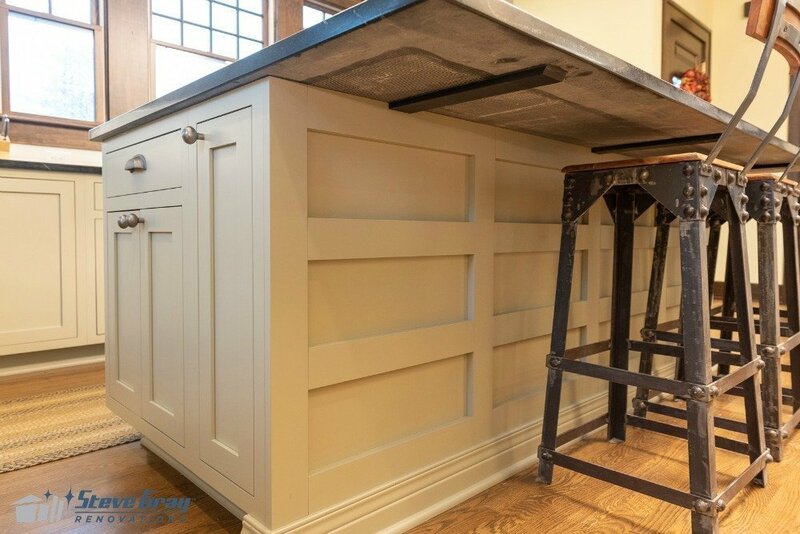 The island design called for a wider than average countertop overhang. Instead of corbels, we added a steel brace under the stone, keeping the clean line look without compromising the structure. The new windows were a part of the design where details made a difference. We created the layout so the windows in the new addition would line up with the windows in the front of the home. This allowed a clear view through the entire first floor to the backyard. We were able to install new windows that matched the old style in the front of the home. These are the kind of details that make this job fun. Kathy Hoskins from Hoskins Interior Design was our partner is ensuring the Arts and Crafts style was adhered to in the new things we created. One of those aspects was helping the homeowner choose the pendants over the island. Lighting is one of the stars of a design since it illuminates, therefore drawing attention to itself. Kathy made sure what was chosen offered the right impact, functionality and style for the space. As I mentioned at the start, it’s the details that carry off a style, but they also are what make any renovation project look complete. 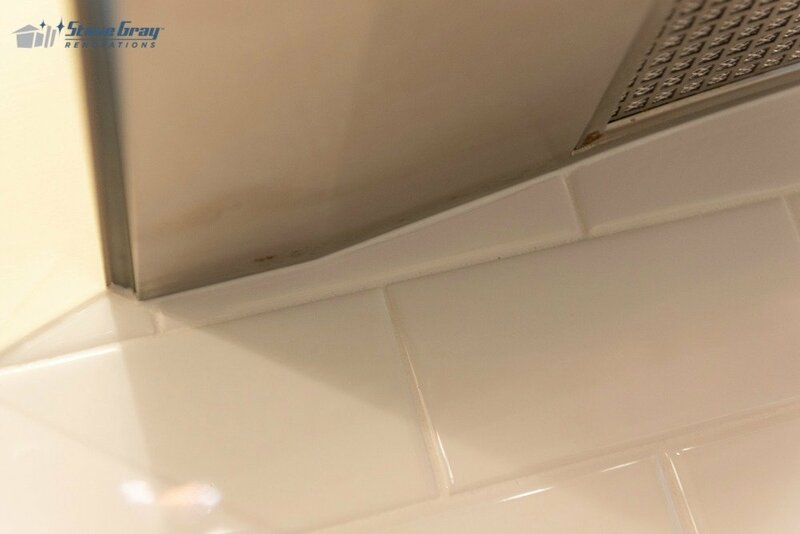 For example, our client did not want the backsplash tile to go all the way up to the ceiling. This meant we had to tuck the ends right up against elements like the vent hood. Also, we placed the wall outlets horizontally and low to allow the beauty of the tile to go uninterrupted. It is these small details that heighten the beauty of the design and keeps a homeowner fully happy with their new space. At Steve Gray Renovations we build in just one style – the one our clients are looking for. If you take a look at our portfolio, you will see many different kinds of designs. While the Arts and Crafts style may not be for everyone, we thoroughly enjoyed providing the exact look our client wanted. Whether you love Mid-Century Modern, Transitional, French Country or Modern design, we can help you achieve your vision for your home. Send Steve an email or give me a call at 317.596.0928 to discuss your renovation plans.